Begin by forming a dike around the outer edge of the spill. This will limit the contaminated area. Continue applying the product working toward the center of the spill. When all the liquid is covered, sufficient product has been applied. If liquid puddles reappear, simply add more product to those areas. Allow to sit for FIVE minutes, then sweep up with clean-up equipment provided in your Acid Spill Kit. Acid spill cleanup of incidental acid electrolyte spills must be performed with products which appropriately neutralize and adsorb the hazardous battery acid. 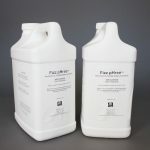 Fizz-Phree quickly, safely, and effectively neutralizes and solidifies battery acid spills. The non-gassing formula prevents acid mist migrating to ventilation systems or splattering on skin, clothing, or equipment. 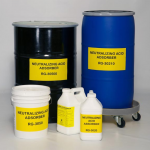 Neutralizing Acid Adsorber neutralizes and adsorbs hazardous acid spills. The non-staining formula leaves floors and equipment dry and stops corrosion. 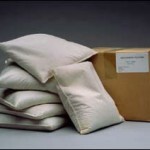 Neutralizing & Adsorbing Pillows neutralize and adsorb hazardous electrolyte spills, making acid spill cleanup simple and convenient. 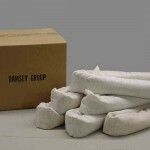 Neutralizing & Adsorbing Booms are also used in acid spill cleanup for neutralizing and adsorption of incidental acid spills. 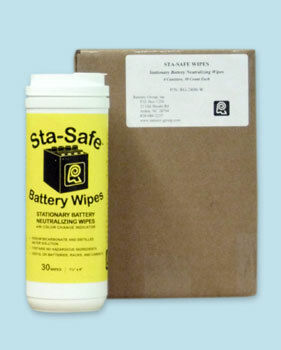 Moistened wipes with color indicator neutralize and remove surface debris from stationary batteries. 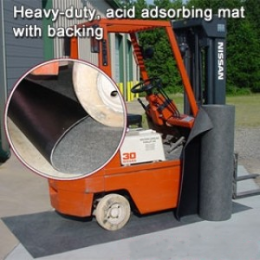 Contain acidic liquid spills and retain in matting to prevent migration of corrosive liquids to floor or drip pan.